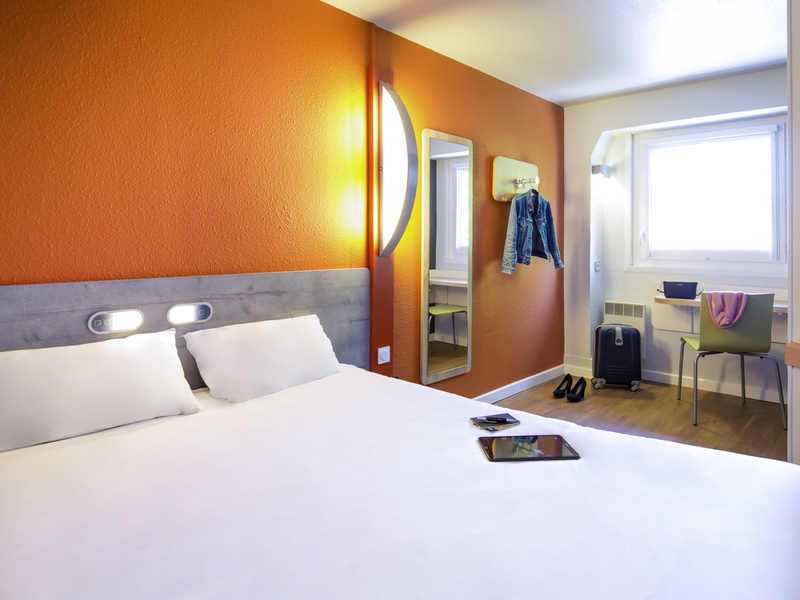 The entire team offer a warm welcome to this city-center ibis budget hotel in one of France's Cities of Art and History. You will love our location on the wine route, near tourist sites, the train station and stores. We have new bedding and windows for enhanced well-being. Great location and close to restaurants. The woman. Who checked us in was very helpful with suggestions to eat and visit. Dear RICHARD H., We very much appreciate your comments regarding your stay at the ibis budget Vienne Sud. Thank you again for sharing your experience, and we hope your next visit will be as pleasant as the previous one. Sincerely, Damien. Basic but adequate room. Decent breakfast. Friendly hostess at the reception. The floor in our room was sticky and not clean. The bathroom smelled badly of urine. And the small amount of wather coming out of the shower not sufficiant. The staff was nice! Dear METTE K., Thank you for taking the time to tell us about your experience at the ibis budget Vienne Sud. I am sorry that your experience did not meet your expectations; please allow me to express my sincerest apologies. At Ibis Budget, we strive to provide a superior service experience for every customer; therefore your feedback is very important to us. Please rest assured that we are taking the appropriate measures to address the problem and prevent future occurrence. We appreciate your sharing your concerns, and it is our hope that you will give us the opportunity to better serve you in the near future. Sincerely, Pierre. Pleasant Windows are noise proof. Everything was great apart from a nasty smell in the bathroom that was worse when we arrived than after a few hours - drains!! Dear GAEL B., We very much appreciate your comments regarding your stay at the ibis budget Vienne Sud. It is always a pleasure to receive positive feedback. I will share your comments with our team. I am sure that this feedback will serve as an encouragement to all of our staff as we strive to continuously improve the quality of our services. Thank you again for sharing your experience, and we hope your next visit will be as pleasant as the previous one. Sincerely, Isabelle. Nice welcome and advice on where to park. Room was clean and up to usual standard. Dear MARTIN W., We very much appreciate your comments regarding your stay at the ibis budget Vienne Sud. It is always a pleasure to receive positive feedback. I will share your comments with our team. I am sure that this feedback will serve as an encouragement to all of our staff as we strive to continuously improve the quality of our services. Thank you again for sharing your experience, and we hope your next visit will be as pleasant as the previous one. Sincerely, Isabelle. Inexpensive but the location was difficult for parking and noisy at night from outside disturbances. Everything was okay. A bit weird having a hotel built over a road! If you opened the window during peak traffic times you could smell car exhaust fumes. Nice to be able to meet up with my friends amongst the staff in the hotel. It was a stay in town during a camping holiday and we found the hotel ideal. Dear PETER B., We very much appreciate your comments regarding your stay at the ibis budget Vienne Sud. It is always a pleasure to receive positive feedback. I will share your comments with our team. Thank you again for sharing your experience, and we hope your next visit will be as pleasant as the previous one. Sincerely, Isabelle. On arrival and on departure the personnel was very welcoming and polite. The room was clean and I was suitably impressed. The only thing I was a bit disappointed with was that some people were noisy in the corridors when I was in bed and I could also hear people outside on the street in the early hours of the morning but they probably weren't guests staying at the hotel.